Few people need an introduction to Buzz Charlton, made famous over the last decade with a series of elephant hunting DVDs set in Zimbabwe. If you haven’t seen them, you should—they have the power to raise the hackles on an 800-pound dead gorilla. Buzz is also known for shooting crop-raiding Problem Animal Control (PAC) elephants and ornery, cranky tuskless cows in the thick jesse bush of the Zambezi Valley. This sort of hunting quickly distinguishes the men from the boys—it is definitely not for the faint of heart. In fact, at a recent safari convention Buzz admitted to us that he was doing less of that type of hunting because he wanted to see his girls grow up. This does not mean he has stopped going after elephants, but rather he is now concentrating his hunts along the Mozambique border for trophy bull elephants . . . as if that is a tame way to spend one’s professional career! Limited first edition of twenty-six leather copies of the first edition are lettered A-Z, signed and housed in a finely crafted clamshell box. While the book has a good deal of elephant hunting, it is really a celebration of a brash safari PH who hunts all kinds of dangerous and devious critters and gets into scrapes in the bush with all of them . He is refreshingly honest about his own mistakes and shortcomings and is not afraid to point out clients who could do with some modesty, more skill, or better behavior! However, in his twenty-five years as a PH he has formed close bonds with many clients who keep coming back to hunt again and again with Buzz. This attests not only to his skills as a PH but also to his character. Even though his father, who was a PH with Kerr & Downey Safaris, died when Buzz was very young, Buzz seemed destined to fulfill his father’s ambition to make a lifelong career out of hunting big game. As soon he was old enough, he became an apprentice hunter, eventually landing up with Zambezi Hunters to complete his training. It was there he a found a man who would not only mentor him but would also help him achieve his dream. Dengesi was the man’s name, and he was the first black professional hunter in Zimbabwe. It was under Dengesi’s tutelage that Buzz completed his three-year training to become a professional hunter. Some of Buzz’s funniest escapades come from that time. 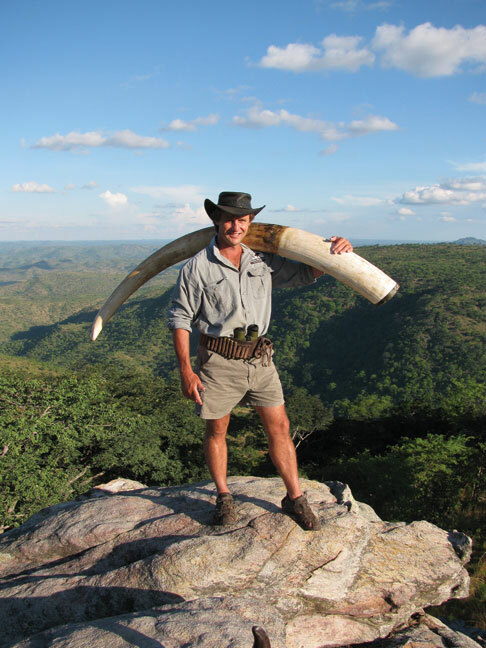 Ian Piercy ran Zambezi Hunters, and one of Buzz’s first tasks as an apprentice was to shoot a buffalo cow for lion bait. Buzz jumped at the chance. He was to find a buffalo cow, cut it into two pieces, and hang the pieces in separate places for lion bait. The problem was that Buzz was given the order late in the day, and he was in an area where there were few buffaloes. What did he decide to do? He shot a pathetic, ugly dagga boy instead. Figuring that if he cut away all the incriminating parts, no one would be the wiser. What happened to him was straight out of a Laurel and Hardy movie. Then there was the time when Buzz realized that he needed to revise his strategy of “shouting an elephant down” if he were to stay alive to hunt another day. Read the chilling tale of how he came to revise his long-held strategy. Finally, Buzz had deadly encounters with more than just the local fauna. Discover how even an innocuous tree limb can turn menacing . . . for one very nearly did him in! Buzz has had a wealth of experience, and that has resulted in a lifetime of great stories. Added to the fact that Buzz can write a good story and present it in a highly entertaining way, and you have the basis for a great book. What you will find here are the absolute best, most exciting, hilarious, and hair-raising stories from an experienced individual who has literally spent tens of thousands of hours hunting in Africa’s wilderness. Whether it is a broken nose received from a late night bar encounter, a terrifying elephant or buffalo charge, or a difficult safari client who desperately needs a lesson from the bush, you will be thrilled to read one good adventure-laden chapter after another. Foreword by renowned Zimbabwe PH Richard Harland. 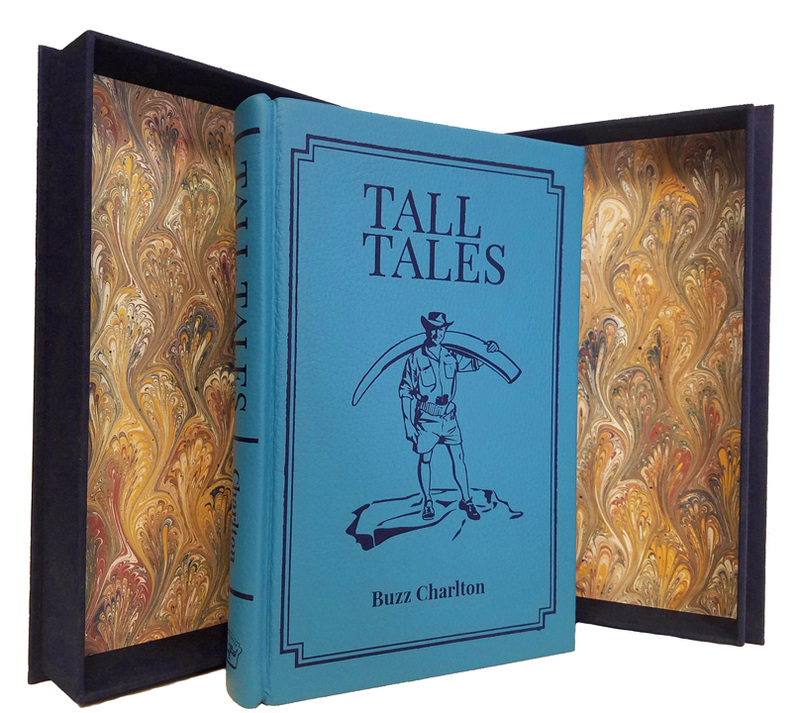 Submit your review for "TALL TALES (Leatherbound Edn.)"